We are all set up!!! After boxing up our tools and supplies for the first time in ten years, we have unpacked everything in our new location and are back to work! Last week was our first week working in the new shop and it was great! 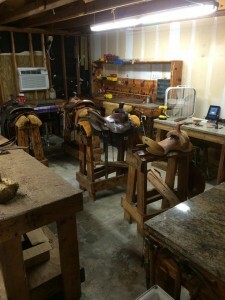 We still have a bit of adjustments to make, but all in all we are back at slinging leather! Our new address is 3805 Ranger Suite A right next door to J Cody’s BBQ off South College. This location is not permanent as we are preparing for building a facility on our own property within the next couple of years. At this time the shop is just that… a Workshop. We do not have a physical store front and we don’t have any immediate plans for one at this time. Our goal with this location is a place to work and increase our productivity and shorten our lead times on saddles and custom items. We are still actively taking in repair and new custom work so if you are in need of repair work being done give us a call and you are more than welcome to come by the shop for us to help you. Or if you just want to see the new facility just call us and come by! As for keeping up with what is going on in the shop, you can always find the latest here on our website or through our facebook page and other social media! We are working on some really great new features of the website that should go live by the beginning of 2016!!! Thank you so much to all our fantastic customers for the support and patience as we make this transition to better serve your needs! If you need anything at all, don’t hesitate to call or come by for a visit!